Whitaker was an Academician in the National Academy of Design. Throughout his lifetime, he won more than 150 awards for his watercolors. He served as president of the American Watercolor Society from 1949-1956. He also served as officer/board member of numerous other national and regional art societies and was listed in a number of Who's Whos. In addition to his painting and leadership contributions in the visual arts, Whitaker wrote two books on watercolor, "Whitaker on Watercolor" and "A Guide to Painting Better Pictures", and a third, "The Artist and the Real World," random reflections on the art world. He is the subject of a biography, Frederic Whitaker, by artist/author Janice Lovoos. He wrote more than 90 articles on artists for American Artist magazine, and was a contributor to The Artist of London and Today's Art, New York. Frederic Whitaker was born in Providence, R.I., Jan. 9, 1891, and quit school at age 14 to go to work. By age 23, Whitaker was head of design at Feeley. He juggled skills as salesman and designer, as adept in the business end as in the creative side meanwhile painting watercolors, actively participating in art societies, and entering competitive exhibitions. In 1943, artist Frederic Whitaker met artist Eileen Monaghan, who was to become Eileen Monaghan Whitaker, at a one-man exhibit of his work at Ferargil Galleries in New York City. In 1949, Whitaker retired from business to devote himself to painting, writing, and serving in varying leadership capacities for art societies. In 1965, the Whitakers moved to La Jolla, Calif. He died in his home March 9, 1980. 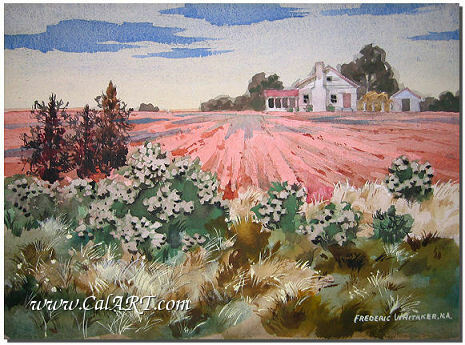 Beautiful farm scene watercolor by California artist Frederic Whitaker, N.A. Painting measures approx 15" x 22", is signed lower right and is in excellent condition. Whitaker was a National Academician who's work received more than 150 awards during his lifetime. He also served as president of the American Watercolor Society from 1949-1956. For more biographical information of Frederic Whitaker, click the "more by this artist" link at the top right of the page.